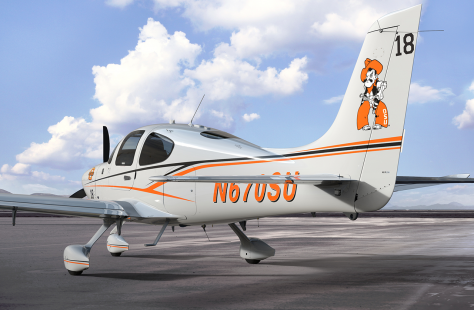 Stillwater, Oklahoma (18 January 2019) – Oklahoma State University (OSU) today announced the selection of the technologically advanced Cirrus Aircraft SR20 as an addition to its existing Aviation Program fleet. This is the first partnership between Cirrus and OSU, resulting in five new aircraft for the well-established aviation program. Cirrus Aircraft is the recognized global leader in personal aviation and the maker of the best-selling SR-series piston aircraft and the Vision Jet, the world’s first single engine Personal Jet. Founded in 1984, the company has redefined performance, comfort and safety in aviation with innovations like the Cirrus Airframe Parachute System® (CAPS®) – the first FAA-certified whole-airframe parachute safety system. To date, worldwide flight time on Cirrus aircraft has passed nine million hours and 170 people have returned home safely to their families as a result of the inclusion of CAPS® as a standard feature on all Cirrus aircraft. The company has three locations in the United States, located in Duluth, Minnesota, Grand Forks, North Dakota and Knoxville, Tennessee. Oklahoma State University is a modern land-grant university that prepares students for success. OSU has more than 35,000 students across its five-campus system, with students from all 50 states and around 120 nations. Established in 1890, Oklahoma State has graduated more than 240,000 students who have been serving Oklahoma and the world for 125 years. Oklahoma State University aviation is the fastest-growing program in the College of Education, Health and Aviation, enrolling more than 300 students annually. The program offers undergraduate degrees in aerospace logistics, aerospace security, aviation management, professional pilot and technical service management. Oklahoma State is also one of only 18 universities in the nation to offer graduate-level aviation degrees.